“We are in the challenge of our lifetimes,” Pardeep Kaleka wrote this in a note to me Sunday morning. Like the rest of us, he feels the dangers of hate in this moment, but more acutely because his father was killed by a white supremacist at the Sikh Temple of Wisconsin five years ago this month. 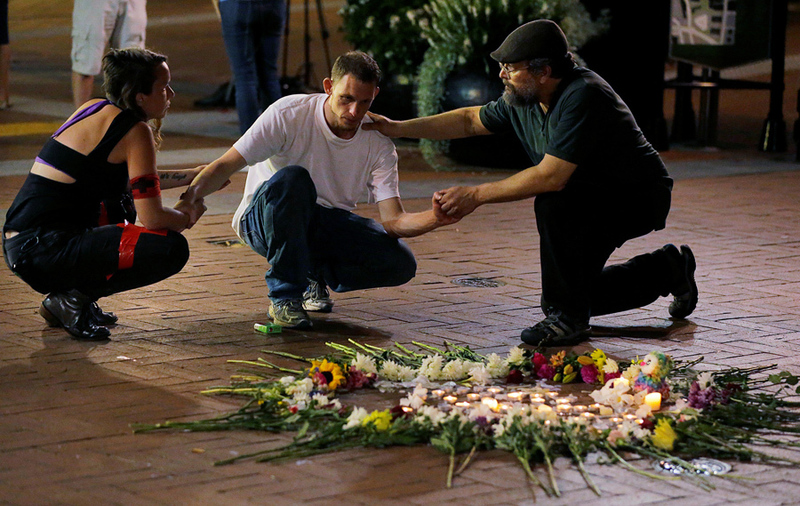 Since then there have been deadly hate crime killings from Charleston to Orlando and Portland. Now, Heather Heyer has been killed, 19 others injured, and two law enforcement officers died in the line of duty in the wake of a large scale hate incursion in Charlottesville, VA.
We will remember these days for the rest of our lives. What will we tell our children and grandchildren about how we faced escalating hate and violence? Telling them we were too busy isn’t going to cut it. What matters most is what we do in the long run, in our local communities, with our neighbors and with people we haven’t yet met. How do we successfully turn this outrage into long term action, not only to utterly reject the most foul messages advocating genocide, but the systemic racism and intolerance that keeps us from addressing our most pressing problems? Quick and massive response is already happening. 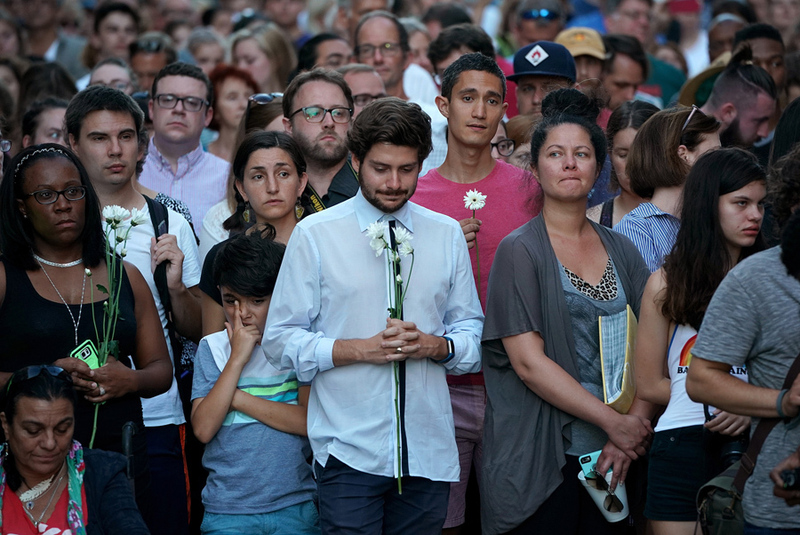 Vigils and rallies have sprung up in cities across the U.S. There is a pervasive spread of outrage on social media, and the rejection of white supremacists is broad scale, from The International Association of Chiefs of Police to John McCain and Senator Orrin Hatch. The Attorney General of the U.S. filed civil rights charges against the domestic terrorist who killed Heather Heyer and injured 19 people. However, the President of this country took days to disavow the messages of Neo Nazis and white supremacists after pressure from the public, then doubled down again to support them in a press conference. The Daily Stormer, a white nationalist online site was gladdened by Trump’s early silence in their favor. At least we know where we stand. Our government may be divided about its resistance to Nazis and white supremacists, but most Americans are not. There are not “two sides.” The only other side to these hate groups is the side of humanity. It’s not that all of the people marching with white nationalists are less than human. If we see them that way, we’ve lost the cause. In these moments, I think of Arno Michaelis and Angela King, two loving and amazing leaders would have been in that march earlier in their lives, but have been drawn away from the darkness by love and kindness. But there is a resurgent attraction to white supremacist groups among young people, and we have to know what we’re up against. Hate groups are seeking violence and a show of their power. We can’t let them set the agenda. Confronting them in the streets is a well designed recipe for violence. At Not In Our Town, we adamantly urge people to stay away from direct interaction at white supremacist marches because such confrontations only give hate groups more of the attention they crave. Most of the community members in Charlottesville did just that. The counter protests by faith leaders and others were planned before the scheduled hate march, and most of them walked away when the hate groups showed up for a brawl. Those who met the white supremacists head on were locked in a violent struggle. But this was not a "two sided battle." Heather Heyer and the 19 others who were injured were killed in an act of terror. We need to do everything we can to protect our people and stand on the side of non violence. We need law enforcement on our side and we need a way to show massive resistance to these groups without jeopardizing the safety of those who want to stand against hate. The hate groups want us to disengage. They welcome Trump's comments that there is equal violence on each side. It is a disgusting lie. Not In Our Town has been working with courageous communities standing up to bigotry for over two decades. We have documented stories of their successful response to hate groups, from Gettysburg, PA to Olympia, WA. In fact, Not In Our Town began with a story of how people in Billings, MT drove hate groups out of their community by the joint actions of ordinary residents. Here is some of what we have learned from this movement that is valuable in this volatile moment. Fear and intimidation won’t work if we mobilize the broader community. Hate groups associated with the Daily Stormer tried to terrorize and intimidate the Jewish community of Whitefish, Montana last December, but they were thwarted by visible and vocal support by local community members, every elected official in the State of Montana and local media who repudiated the anti-Semitic attacks. Communities across the country, legal organizations like the ACLU and Lawyers Committee for Civil Rights organized swiftly to support the Muslim and immigrant residents when Trump announced the Muslim ban and immigrant deportation orders earlier this year, and the courts upheld the core values of our constitution. If we want to stop hate, we have to start with ourselves and deal with the underlying racism and intolerance that plagues our country. This is a deep challenge, but we can’t deny it, and there are ways to begin. For people who are still suffering from white blindness, if we don’t open our eyes and work to recover from this affliction, the harm may become irreparable. We have to seek light in dark times. A broad force of people in this country reject and resist the messages of white supremacists. People of color and LGBT people are standing firm and leading. How can we turn into a real rejection of the racism and bigotry that people experience every day in our communities? Charlottesville may well be a place that helps guide all of us on what to do. A powerful, diverse group of people in Charlottesville have been working for a long time to not only resist this most recent series of hate group rallies in their town, but to recognize the legacy of slavery and racism that their city and university was built upon. Mayors, City Leaders and Police Chiefs need to step up and galvanize their communities in times of crisis. What leaders say and do can make all the difference in building resilience and capacity for change in the face of hate. After the hate crime killing of Marcelo Lucero, an Ecuadorian immigrant in Patchogue, NY, Mayor Paul Pontieri faced his own denial, reached out to Latino residents in his town, and urged the community to stop the anti-immigrant rhetoric and messaging that may have influenced the seven local high school students involved in the killing. Oak Creek Mayor Steve Scaffidi and Police Chief John Edwards stood firmly with the Sikh community and made a commitment to continue actions against the intolerance after six people were killed at the Sikh Temple in 2012. Charlottesville Mayor Michael Signer has shown signs of support for people seeking to address the legacy of racism that brought the wrath of the white nationalists to his city. He has also been targeted by anti-Semitic attacks by these groups. We need to bolster upstanding leaders, and demand action from those who remain silent. A firm stand against hate and for towns and cities where everyone can feel safe requires is a long term commitment. Diverse community members have been joined by their faith and civic leaders in Not In Our Town communities who have been practicing anti hate/pro-inclusion action for many years. Their children have watched them be consistent in their rejection of intolerance and support for all residents. Their teachers and school leaders work to give students the tools to stand up to bullying and hate. Their law enforcement leaders work with people who are vulnerable to hate on hate crime prevention. You can learn from these communities too. Our films, stories and guides are free online. Start with the story of Pardeep Kaleka’s town in Oak Creek, Wisconsin. Share them with your community, and learn how to start a NIOT group here. This is a crisis moment, and change can be hastened in times like these. We have so much to do. Petitions, social media, marches and vigils are important, but don’t stop there. We are in the challenge of our lifetimes, and to meet it, we have to make a deep and long term commitment to stop hate, together. Please share photos and updates about local actions. facebook.com/notinourtown. If you can give money, organize giving circles, please donate now. We urgently need funds to do more. You can face fear. Find courage and stop hate together. People like you will make it possible to stop hate. Keep On. Read more on five quick action steps that people can take now.